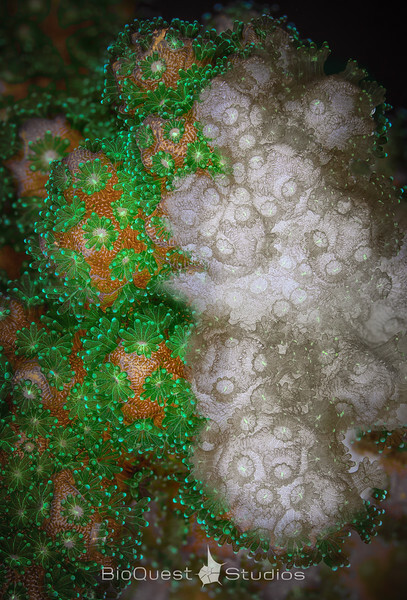 Pocillopora damicornis photo composite showing a healthy colony (left) and bleached colony (right). The photos of the same area were taken about 10 days apart to show coral bleaching (loss of Symbiodinium) progress. Some of the symbiotic zooxanthellae are still present in the bleached coral tissue (visible as gray-brown dots). The healthy coral, on top of dense algal population, has fluorescent pigments. Each image is a deep focus stack with deconvolution algorithms applied, resulting in incredibly sharp and detailed look.